We finally have our first restaurant review of 2018. 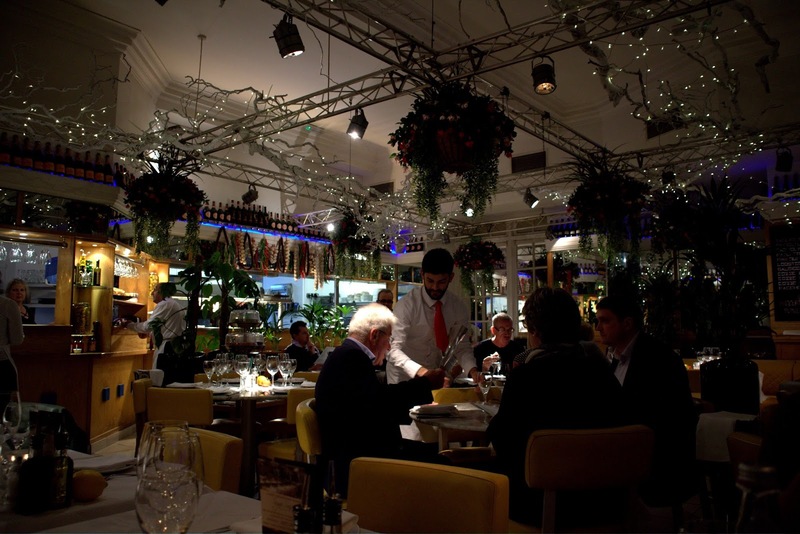 San Carlo is a group of award-winning contemporary Italian restaurants that has grown to become a £60 million restaurant empire which currently has 16 authentic restaurants across the UK. There's 3 based in London, Bristol, Liverpool, Leeds, Cheshire, Manchester and in my hometown of Leicester. I have often associated this restaurant as one enjoyed by the Leicester City Football Club. I don't know why I haven't visited before but my recent visit has definitely encouraged me to dine there again. 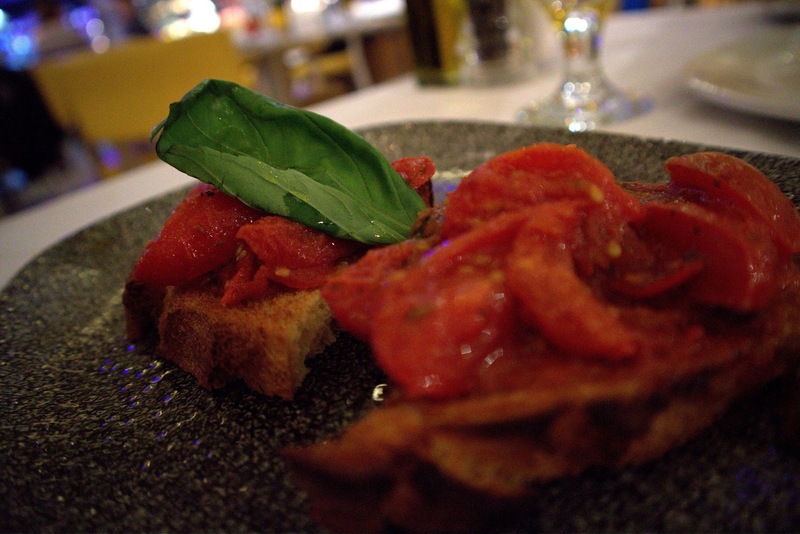 San Carlo has recently introduced their new Cicchetti dish menu. These award-winning dishes are medium sized dishes that are typically served in Cicchetti bars in Venice. This style of dining is quite similar to that of Tapas. It's great for sharing and sampling a variety of different flavours all in one visit. 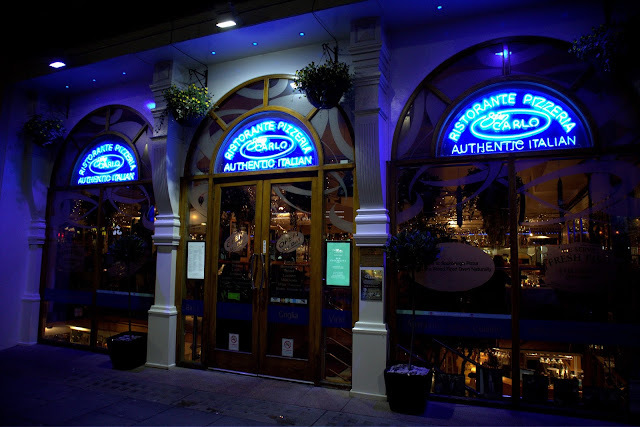 All of the dishes available are cooked at the point of order using the finest of Italian produce they can supply. Their chefs regularly travel across Italy in search of new and authentic recipes and special ingredients they can then bring into their restaurants. The restaurant has a definite comfortable atmosphere and the staff are very attentive to their customers as you arrive. As we arrived we noted that quite a few customers dining were probably regulars to the restaurant and that shows the reception the restaurant has before we even dined here. This new menu is served as soon as they are ready, allowing you to really indulge and get stuck into your food as soon as its ready. They advise to have 5-6 dishes between 2 people. We forget this small print so we definitely could have done with ordering more than the 3 dishes we ordered. 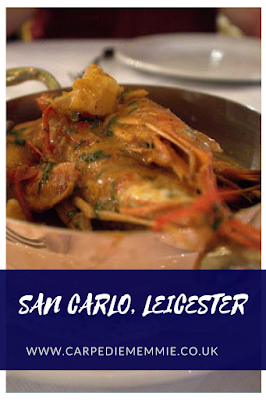 San Carlo has a vast variety of food to offer, with 22 spectacular seafood dishes to the freshest antipasti, grill specialties as well as a broad range of meats, pizza, and pasta recipes. There is so much to choose from. 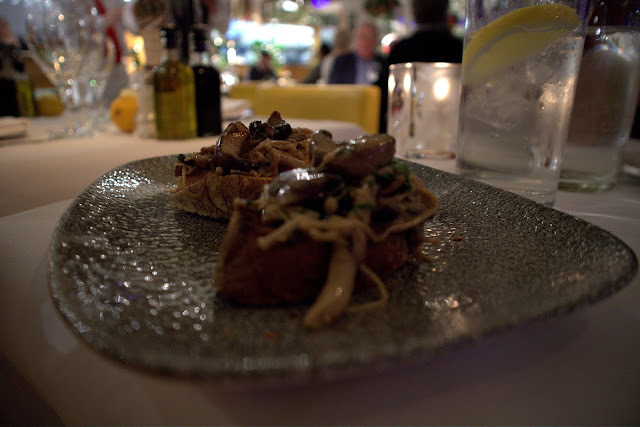 To begin with, we sampled some of their Bruschetta; one with mushrooms, garlic and rocket and the other with Sicilian Pachino tomatoes, garlic, and basil. The one with tomatoes, garlic, and basil definitely had more flavour to it. The tomatoes were really delicious, whilst the mushroom topped Bruschetta was extremely bland and I couldn't quite finish it. For our mains we decided to choose a dish each and then something to share, we definitely should have ordered more as I mentioned we weren't quite full enough afterward. Take note of this for your visit. I definitely wanted to try something different so opted for the Gamberoni Piccanti. This dish was Sicilian prawns with chili, lemon, and garlic. 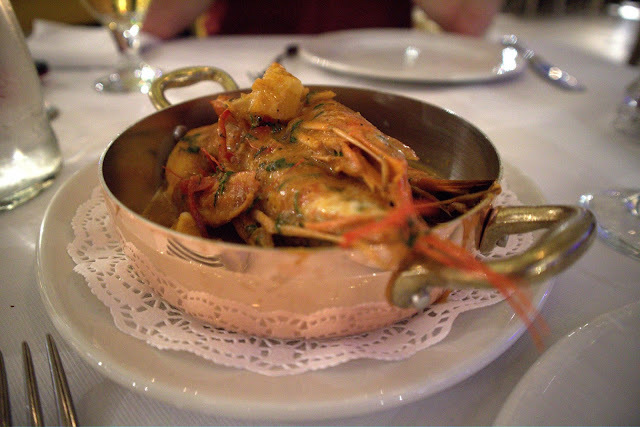 This dish came with 3 prawns, delicious flavour but I eat them within 5 minutes they were that tasty! I had these with some fries on the side but on my next visit, I would probably accompany this with a Chicken dish to try. Jordan decided to sample one of their specials for the evening, Half a Lobster. I haven't sampled Lobster before so this was the perfect opportunity to do so. The flavour was slightly salty but definitely pleasant and something I would try again. You can see from my photos that the portions are slightly smaller than you'd expect to see. I was hitting myself afterwards that I didn't order more things to sample. To complete our dining experience at San Carlo we had to sample a dessert. San Carlo's desserts are all made daily by themselves, enhancing the fresh flavours that San Carlo thrive on for its customers to enjoy. 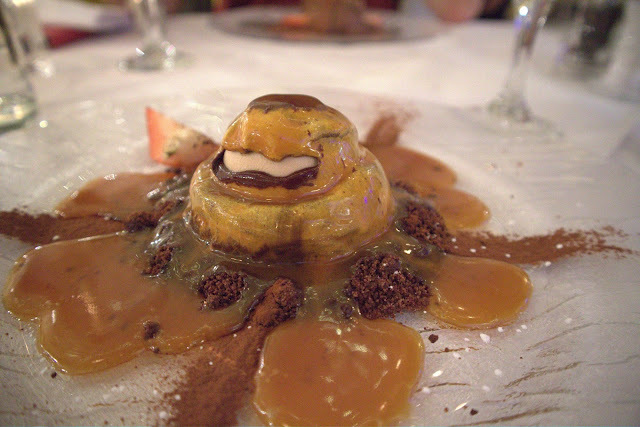 I went for the Chocolate Bombe pudding, don't ask how I pronounced the name of this pudding because it's highly embarrassing. It was delicious. It had flavours of hazelnut, chocolate, and caramel that is perfect for the sweet tooth lover. 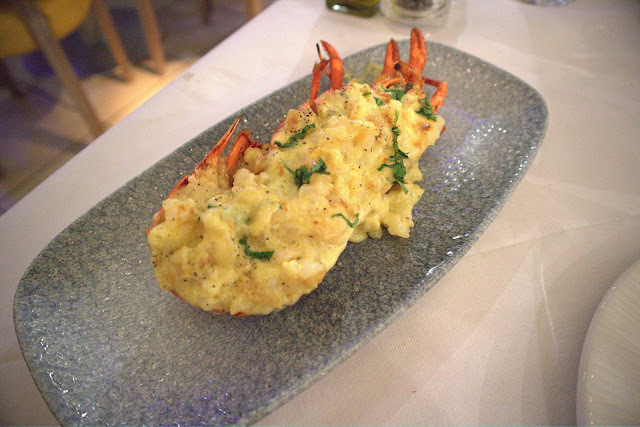 Overall San Carlo was a really great dining experience, the staff were extremely attentive with us and enjoyed sharing with us the ethos and importance of great food being served. I'll definitely be heading there for a drink and a delicious dinner with my friends. San Carlo in Leicester is situated on Granby Street, around a 10 minute walk from the Leicester Train Station. *Complimentary meal in return for this review. All thoughts and photos are my own. If you enjoyed this post and enjoy a good glass of wine then you may want to check out my review of Veeno in Leicester. This place is not far from San Carlo either! I've heard of the San Carlo group, the restaurants are supposed to have great interiors and good food, was great to read a review of one!